The International SpaceStation has received a new load of supplies from the latest Russian-built cargofreighter, which successfully docked to the outpost Saturday night. The Progress M-03M shipattached itself to the Earth-facing port on the Pirs docking module at 9:40p.m. EDT while flying in orbital darkness 225 miles above the South Atlanticoff the coast of Uruguay. It's the 35thsuch spacecraft sent to the station over the past decade. "Congratulations onthe successful docking," Mission Control-Moscow radioed the crew. The space station isoccupied by the Expedition 21 crew of commanderFrank De Winne, Russian cosmonauts Roman Romanenko and Maxim Suraev,Canadian astronaut Robert Thirsk and NASA astronauts Jeff Williams an NicoleStott. The crew is scheduled toopen the hatchway and enter into the Progress overnight. The Russian-made craft isdelivering two-and-a-half tons of supplies tothe station. The "dry" cargo tucked aboard the Progress amountsto 1,750 pounds in the form of spare parts, life support gear and equipmenthardware. 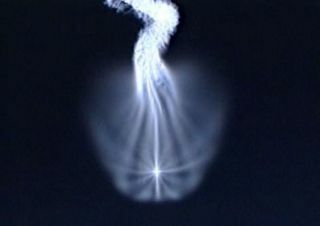 The vessel was launchedWednesday night from the Baikonur Cosmodrome in Kazakhstan.